I talked with a guy recently who told me he felt guilty because he wasn't "winning anyone for the Lord." Why the guilt? Apparently he has been told by someone at his church that if he's really committed he should surely be "winning someone for the Lord." He said he hears something like that in almost every sermon application: a committed Christian should be personally evangelizing the lost people around him/her. I pushed back on that. I said that he shouldn't feel guilty because the hyper-emphasis on personal evangelism is misguided in that it actually overestimates his role and minimizes the church's role in salvation from beginning to end. It's ironic that the message of forgiveness and hope that he was told to proclaim was actually making him feel guilty and hopeless! Personal evangelism is based on the idea that if this guy learns the right methods of persuasion (How To Win Friends and Influence People) and arguments for factuality (Evidence That Demands a Verdict), then he can convince people to become Christiains. That's misguided, though, because the onus is on all on him, his technique, and his knowledge. In my opinion, this aproach is so popular in our churches because it's a lot easier to tell individuals how to do the work the of evangelism on their own than it is to cultivate a community where someone who is not a Christian would actually feel drawn and welcomed to learn about, think through, and grow into the Christian faith. I suspect that, like my friend, many people in churches that place a lot of emphasis on "personal" evangelism are gripped with the anxiety of feeling like they don't measure up because they aren't "sealing the deal" by getting people to make a decision to accept Christ. Eventually that anxiety can become self-doubt ("What wrong with me? "), or even self-betrayal ("I'm a failure."). To help their members try to achieve on their own what the church community ought to achieve together, churches offer training classes for how to make an effective "salvation presentation." The presentations range from professionally packaged programs like Evangelism Explosion and F.A.I.T.H., to informal strategies like "The Romans Road." 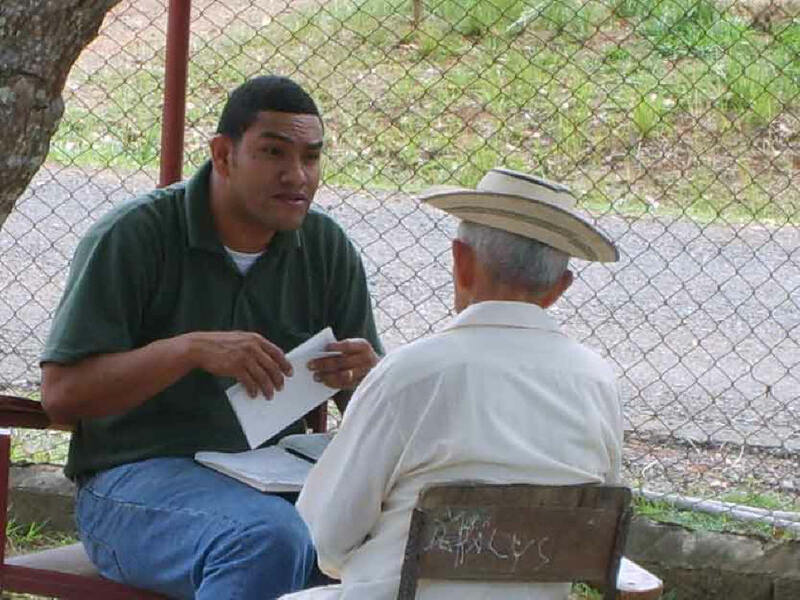 The goal of both formal and informal kinds of program is to help solo church members with personal evangelism. I should point out that I have some experience with this kind of thing. At the first church I ever attended, I was coached to intrude upon people who were eating at the food court in the mall. I'd walk up to a guy eating a gyro wrap and say, "Um, excuse sir...have you broken any of the Ten Commandments?" That never did get very far! Another time I was taught a trendy method called "Survey Evangelism." I'd ring the doorbell and explain that I was from a local church and we were interested in better understanding our community by asking them a few questions. The series of questions went from vague to explicitly religious. The final question was something like, "When you die, why do you think God would let you into heaven?" If the person hinted at something other than "forgiveness through my relationship with Jesus," the packaged salvation presentation was close at hand and ready for delivery! In addition to being misguided because of its basis on what a single person knows and can present, the standard practice of personal evangelism is also misguided in its aim. I used to participate in evangelistic outings (when church members disperse to share a salvation presentation - going door to door, for exmaple - and then join back together an hour later to tell about how it went), and I can say that the aim of such outings is to get someone to become a Christian. But we should ask if someone can even make such a life-altering decision at a moment's notice - based only on the persuasion and argumentation of a stranger? Gordon T. Smith has done extensive research on religious conversion. He insists, "Without doubt, the greatest problem with the assumption that conversion is punctiliar is that it rarely ever is" (Transforming Conversion, 6). It takes time (what psychologists call "liminal space") for someone to reflect on their life, think about their future, evaluate their beliefs, and then to reevaluate each of those things in light of the news that "Jesus is Lord." Beyond that, after pointing out that we don't even retain 50% people who make the types of decisions aimed at in the evangelistic styles mentioned above, Scot McKnight insists that "focusing youth events, retreats, and programs on persuading people to make a decision disarms the gospel, distorts numbers, and diminishes the significance of discipleship" (The King Jesus Gospel, 20). In other words, when you try to persuade people to become Christians at a moment's notice, even success amounts to failure. So, if I'm right (even partly) about personal evangelism, what can we do? In my opinion, the best evangelism for today is the kind that invites others to participate in/with a community of people who are experiencing and sharing the love and mercy of God. In that way, each person is freed from the pressure associated with doing/not doing personal evangelism. After all, the whole of the group is greater than the sum of its individual parts. "Accept Christ" or "Follow Jesus"